If you're going after big game with a shotgun, you need some serious firepower. 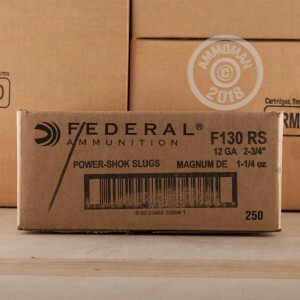 That means a 12 gauge firing powerful ammo like these Federal Power-Shok slug loads. These 2-3/4" shells come in boxes of 5 fire a 1-1/4 oz. 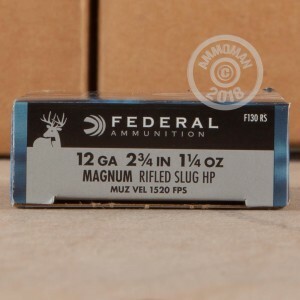 (547 grains) rifled slug at a muzzle velocity of 1,520 feet per second, delivering strong accuracy out to 75 yards and beyond, in excess of that provided by buckshot. 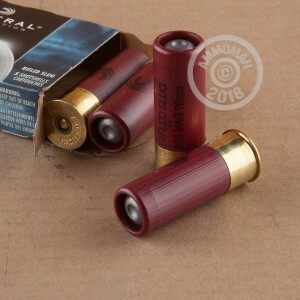 The TruBall slug used in this ammunition is designed for smooth-bore shotguns. It is named for the plastic ball inserted between the wad and the slug. The ball helps stabilize the slug and produce better accuracy without adding too much to the per shell cost. Federal ammunition is loaded in Anoka, Minnesota. Enjoy free shipping on Federal products and many other great brands from AmmoMan.com with any order over $99!